It wasn’t too long ago that baggage carousels were filled with bulky suitcases in black and brown, and the only way to tell your bag apart was to secure it with a bright ribbon. 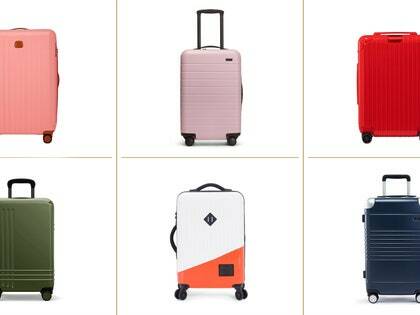 Now, companies new and old, like Away and Tumi, have begun a bona fide renaissance of colorful luggage, making simple, hard-shell suitcases in bright, bold colors and offering tons of customization options. 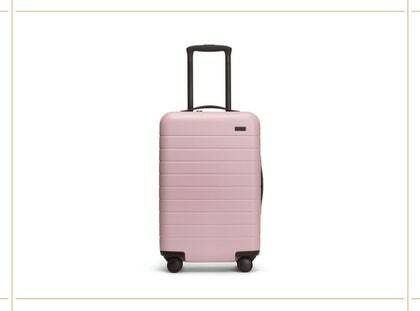 Keep reading for our favorite rainbow-hued suitcases on the market right now, and don’t worry if a bright pink roller isn’t your thing: even the black, dark green, and navy bags in the new luggage cohort have a sleek finish that will distinguish them from the crowd. Ever since Herschel Supply Co. introduced a new travel accessories line last summer, it’s been one of our luggage go-tos. 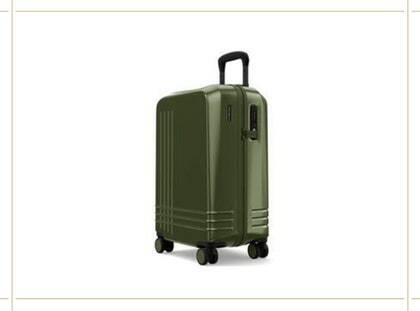 This four-wheel carry-on has a split design with interior mesh storage compartments, as well as a USB charging port, removable battery, and TSA-approved combination lock on the zipper. We love the juxtaposition between the two-tone exterior and the black-and-white striped interior. A collaboration between celebrity hairstylist Jen Atkin and Calpak, this glossy carry-on will stand out wherever it goes. Its polycarbonate hard-shell exterior is lightweight and durable, and its corners have aluminum covers for added protection. 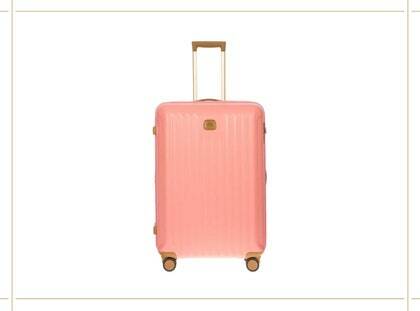 As for extras, it comes with a clear luggage case and a sticker set so you can personalize to your heart’s content. 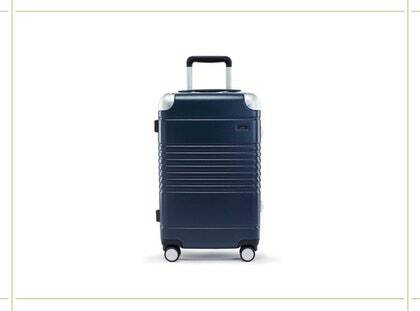 Rimowa luggage is known for its ultra-sleek design, but you’re more likely to see the suitcases in their signature aluminum exterior than a bright, poppy hue. Little-known fact: The German brand offers a range of colorful polycarbonate bags that are just as durable (and a little more affordable) than the classic aluminum Cabin case. 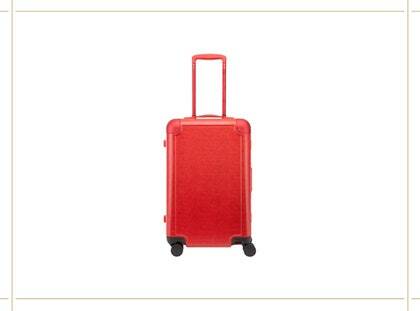 Away has, without a doubt, been a pioneer in the colorful luggage trend. The brand has ten core colors, like blush (above) and sky blue, as well as limited-edition collections, like a winter one inspired by the blueish hues of the Northern Lights. A suitcase with an unbreakable polycarbonate shell, ejectable battery, and hidden laundry bag all under $250? What’s not to love? This lightweight, hard-shell suitcase suitcase from Bric’s, complete with a floral interior lining, is sure to add a pop of color to your travel uniform. An added bonus? Through Bric’s Think Pink campaign, five percent of profits from this bag will be donated to breast cancer research. One of the most bespoke brands out there, Roam has a customization tool that yields more than a million color combinations. 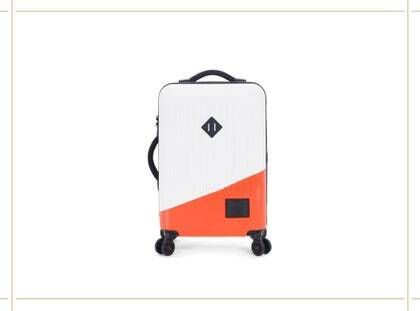 From the case, zipper, wheel hubcaps, stitching, and more, you can design a suitcase that no one else has. And if that much customization isn’t enough, you can also add a monogram. 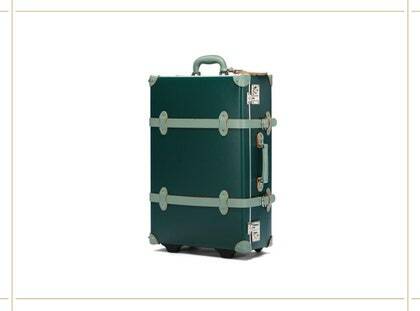 The vintage-inspired outfitter Streamline offers an array of beautiful, colored luggage for modern day travelers. 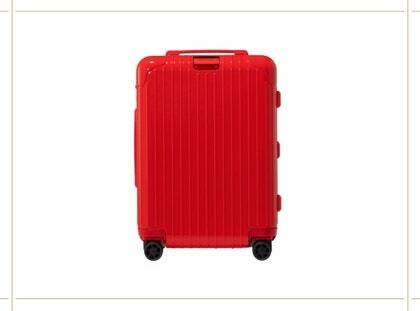 From carry-ons to checked bags to hatboxes, each makes a bold statement. The Artiste Canyon, above, has an evergreen interior with mint-green straps and best of all, a bright, tropical print interior. A sleek, sturdy, and beautifully designed suitcase with just the right amount of color, this suitcase will easily survive the bumps on the baggage carousel. (Arlo Skye’s zipper-less carry-on enforces its already unbreakable polycarbonate shell with an aluminum frame for ultra-durability.) Its interior is lined with an anti-microbial fabric and comes equipped with a removable charger to give a quick boost to your phone when there’s no outlet nearby.